For the first time, the data geeks have finally gotten some love. 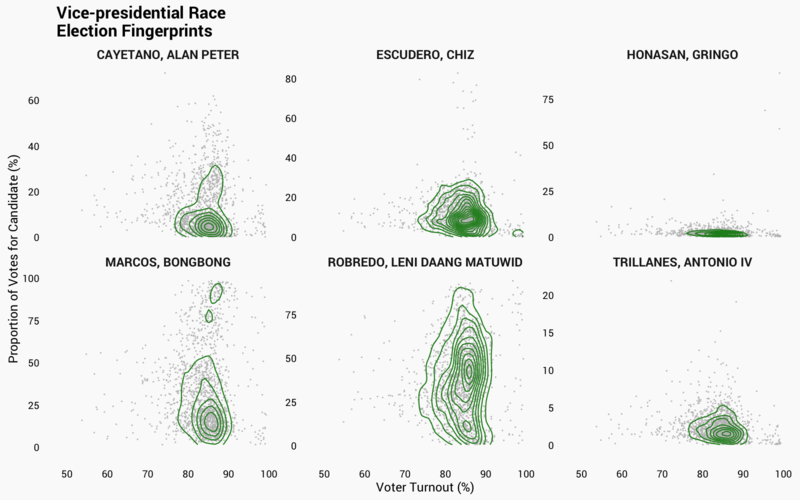 Highly detailed elections results, broken down all the way to the precinct level, have been published online by the Commission on Elections (COMELEC) as well as poll watchers and the media. There are many things I imagine we could do with this data, but one of the most popular uses is to assess the risk of elections irregularities. For the first few parts of this series, we’ll try to carefully and scientifically assess the risk of election irregularities. Going back to the methodology highlighted in a 2014 post, part 1 of this series will focus on detecting elections irregularities through vote padding, defined as the adding of fraudulent votes into the count to increase a candidate’s probability of a win, or, conversely, the shaving of legitimate votes from the count to decrease a candidate’s probability of a win. Vote padding, sometimes called ballot stuffing, is a form of electoral fraud that involves adding fake votes or shaving legitimate votes to favor a particular candidate. This is not be detectable in the final aggregated election results. 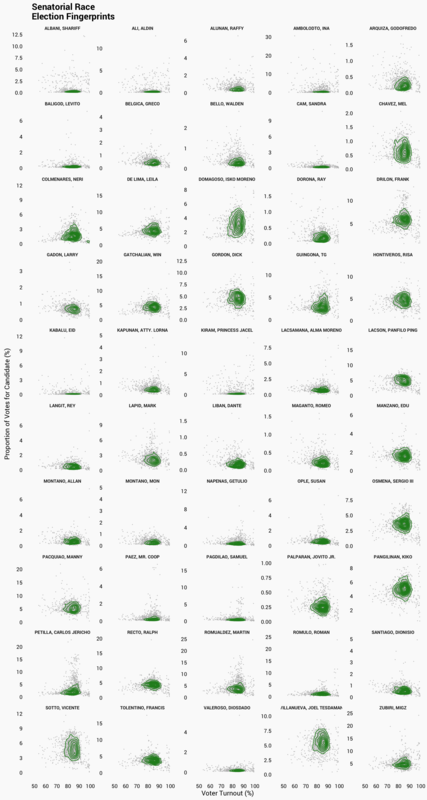 However, if vote padding only occurs in a subset of jurisdictions it can change the distribution of voter turnout and vote share in a way that allows detection from granular election data. Let’s think about this: what happens when fake votes are added to the count? Increase in voter turnout - because there are now more voters than actual, there is an increase in the % of voters that voted in particular cities/municipalities. Increase in candidate vote share - the favored candidate will see an increase in the percentage of votes won. When you have a significant proportion of areas that have this high turnout, high vote share combination, there is an increased risk that electoral irregularities have occurred. How to read the chart: Select a race to view the "election fingerprints" for each candidate in that race. Dots represent a city/municipality, and the contour lines are intended to highlight suspicious groupings toward the top right corner. You can click on each image to enlarge. 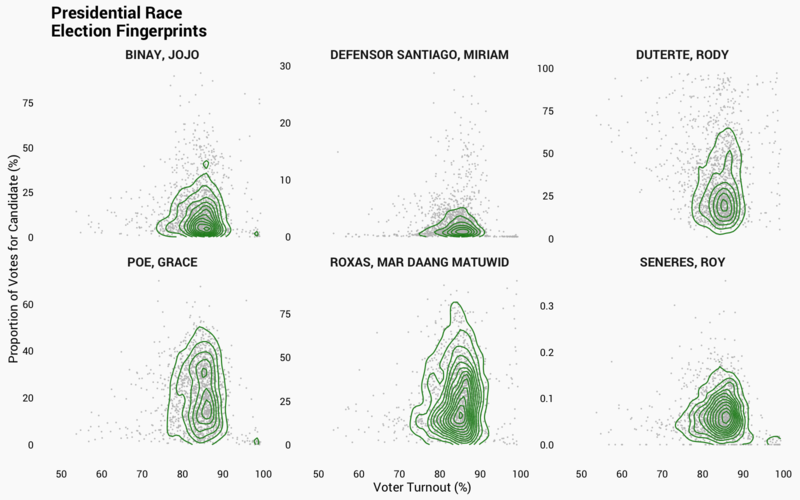 For the presidential race, nothing seems to be out of order, as most of the fingerprints are concentrated around a central mass and with minimal ‘smearing.’ For the vice presidential race, you can see a bit of bimodality in terms of the winning percentage for MARCOS, BONGBONG, but the voter turnout is not high enough to cause ‘smearing’. This is a symptom of a polarizing candidate – some areas voted heavily for the candidate, and some did not at all. For the senatorial race, nothing is out of order. What if the fraud was not as widespread, and it is not immediately detectable by a simple visual inspection? Perhaps, constructing a single index of vote padding risk can allow us to tease out the subtle differences. The authors of the PNAS1 paper have devised a simple logarithmic transformation for the vote counts. The distribution of this transformed variable is most likely to be normal (i.e. bell-shaped) for elections with minimal irregularity. Details of this transformation are outlined in the notes. As expected, logarithmic vote counts from the Russian and Ugandan elections show highly negative skewness and highly positive kurtosis, inconsistent with a normal distribution that has skewness and excess kurtosis of 0. How to read this chart: The closer the values are to the top left corner, the higher the risk of vote padding. Apart from a few party list and senatorial candidates that have understandably strong vote shares in one particular group of cities/municipalities but fall extremely flat in others (BALIGOD, LEVITO, ALONA, KGB, ANG KASANGGA), there seem to be no particular candidates that stand out. Let me be clear: This does not mean that there was no electoral fraud - it simply means that the risk of fraud through this particular form - vote padding or ballot stuffing - is significantly low. Remember, data cannot serve as definitive proof – it can only guide investigation and quantify risk. I highly encourage you to go through these important caveats. Statistics can’t prove nor disprove fraud. At the most, it can assess the risk of fraud and guide investigation. The results of an analysis should be taken in the context of its scope, limitations, and assumptions. Sometimes, these are more important than the findings themselves. Just because this particular analysis shows/does not show signs of electoral irregularity, does not mean that there was/wasn’t fraud committed. Each analysis is designed to detect a particular kind of fraud only. The data was scraped from the COMELEC’s public election results page, as of May 25, 2016. At that time, 96.69% of election returns were transmitted, and 99.93% of city/municipality certificates of canvass were received. For a full list of cities and municipalities that have no results see here. Data, code, and computations are available on Github. This approach naturally removes cases where the voter turnout is greater than 100%, and also when there is a complete win (100% winning percentage). Therefore, this measure is actually conservative because it eliminates the extremes. This scaled vote count $v_i$ is approximately normal when the election results to not contain irregularities due to vote padding. We can therefore quickly assess which candidates have the higher likelihood of vote padding by observing the distance of their moments (skewness and excess kurtosis) from the expected values of a normally-distributed random variable (when $X \sim N(0,1)$$, $$Sk_X = 0$$ and $$K_X = 0$). We could go further by computing their Jarque-Bera Test values, but we are parking that for the sake of simplicity. This post also appears in GMA News! Election fraud in the Philippines is almost always alleged, but never really proven. We can explore an approach that can identify voting data patterns those most likely to be associated with vote padding - adding fake ballots - and find out how the sanctity of the ballot can be preserved by the thoughtful use of election data. The President's annual State of the Nation Address (SONA) is a strong indicator of an administration's priorities and accomplishments, but how do we compare across presidents? We can distill the SONA into numbers and count instances of national issues mentioned in the speech to find out and compare. You can also explore the speeches yourself using an interactive SONA word counter.